Go To Hell is a site specific installation and performance with The Six Tones with choreography by Marie Fahlin. The performance features a installations by Gerhard Eckel and a video installation by Anders Elberling och Henrik Frisk, and video by Jörgen Dahlqvist. Music by Rolf Riehm, Henrik Frisk, Richard Karpen and The Six Tones. Lightdesign Sutoda. Go To Hell: gesture and sound on the threshold. 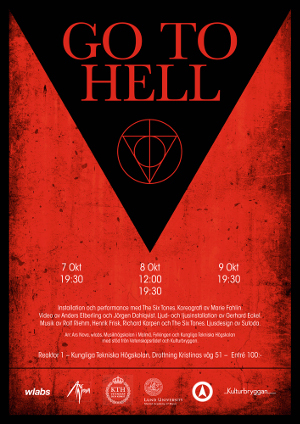 Go to Hell is an installation and performance work set on the threshold between gesture and sound and between the worlds of the dead and the living. The three musicians of the Vietnamese/Swedish group The Six Tones move through the subterranean landscape of the dismantled R1 nuclear reactor like mythological after-images. Fragments from the myth of Orpheus are double-exposed with the tale of a beheaded ghost from Vietnamese Tuong theatre. Evoked by the potential danger of the location, the audience is invited to explore an interactive and open form installation that relates to ancient myth and its bearings on experimental art of today. The choreographies and video art all relate to the gestural and conceptual content of Toccata Orpheus, a composition for guitar solo by the German composer Rolf Riehm. In Toccata Orpheus it is the radical expression of the lyre player’s art that threatens the order of the underworld. Orpheus plays a high-risk game and exposes all the tricks of his musical and scenic skills expressed in intense choreographies of hand and arm movements. A new sound and video installation, by Anders Elberling and Henrik Frisk, an interactive sound and light installation by Gerhard Eckel and the interactive electronic soundscape in the space are derived from analysis of video recordings and of motion tracking data from performance of Riehm’s composition. The fragile plucked sounds and the details of gesture are transposed into an interactive multimedia composition of light, video, sound and movement in Go To Hell. R1 was Sweden’s first nuclear reactor. It was operated from July 1954 until June 1970 at the Royal Institute of Technology (KTH) campus in Stockholm.